Gentle Reader reviews a Keneally family enterprise published by Vintage Random House. Tom Keneally is not only prolific but also versatile, writing popular fiction and popular history. He crosses the genre boundaries – if such they are – easily, as well. His history looks for the good stories (for example, American Scoundrel, The Great Shame); his fiction frequently has a factual element (Gossip from the Forest, Schindler’s Ark). His search for the lively stories in history is not without blindspots but these detract little from the weight and worthiness of his works taken together. 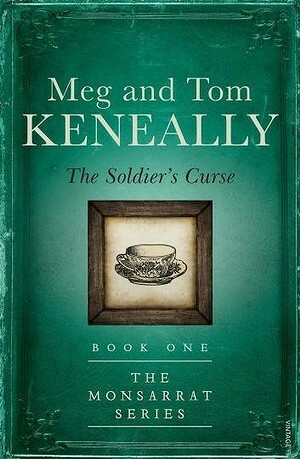 For The Soldier’s Curse, Tom teams up with his daughter, Meg, to seamlessly write a murder mystery set in early colonial New South Wales. The story was inspired by true events and it concerns Hugh Monsarrat, transported for life for pretending to have legal qualifications. A clever chap, despite his misdeeds he becomes a clerk to the commandant at Port Macquarie and soon finds himself caught up in the events surrounding the mysterious death of the commandant’s wife during the commandant’s absence. The housekeeper is blamed for the death, though lurking in the background is the nasty deputy commandant and a private soldier with an old score to settle. The historical locale and environment is sketched in, particularly the underlying tension between the settlers and the Indigenous people. But the strength of the book is its plot, as Monsarrat, after some twists and turns, brings things to a satisfactory conclusion. He looks set for a notable career as clerk to the Governor in Sydney and the book’s appellation ‘Series’ seems not to be in vain. The book was written up in Fairfax by Sue Turnbull and in the Newtown Review of Books by Chris Maher. There was coverage on the ABC. The book has an associated crossword. Gentle Reader is a Canberra lawyer, who recently reviewed Anthony Hill’s For Love of Country for Honest History.